Because the Audi Q7 has plenty of space for cargo, it's a great car for shopping routines. If you want to thoroughly inspect the available space in this vehicle's trunk and cabin, you'll find the Audi Q7 on the lot at Atlantic Audi West Islip. This Audi vehicle has a lot of room in its cabin for groceries. When more real estate is needed for extra groceries, you can increase the storage capacity by folding down the seats. While the seats are tucked away, the cabin has 71.6 cu-ft feet of space. When needed, you can load groceries in this area by opening the trunk door. 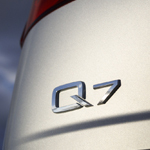 If your hands are full, you can still release the latch by using the Audi Q7's tail gate technology. After you move your foot under a sensor, the tail gate door unlocks and lifts automatically. If you need a car for errands in West Islip, this automobile is a practical choice. When you're not transporting groceries, you can transport many passengers by taking advantage of the convenient seating layout, which supports seven people.